One of two reservoirs in the Highland Lakes chain, Lake Travis spreads across 19,297 acres covering almost 30 square-miles when full. The longest of the Highland Lakes — 65 miles, in fact — Lake Travis winds through the Texas Hill Country from Marble Falls to Austin. In that entire distance, you can speed across the water or just ease along — whatever floats your boat. Lake Travis flows from Marble Falls to Spicewood to Austin. When the reservoir is full, the average depth is 61 feet with its deepest point at 210 feet in the basin. This makes Lake Travis the second-deepest lake in Texas, just behind Lake Amistad on the Texas/Mexico border. Keep in mind that Lake Travis’s level isn’t constant: Water levels can rise and fall dramatically from week to week. The reservoir has a high fluctuation of 10-20 feet due to downstream releases and weather conditions (such as long droughts or heavy rains). Be cautious while boating, especially in the upper end of the lake where the water is the shallowest. Lake Travis starts at Max Starke Dam on the east side of Lake Marble Falls and ends at Mansfield Dam. With 270 miles of shoreline to explore, you can find plenty of space to boat, fish, swim, and enjoy watersports. A popular party destination, Devil’s Cove or Starnes Island (also known as Rattlesnake Island) are both popular spots for boats to tie together and drop anchor. Both are located near the Volente region on the east side of Lake Travis. Fishing enthusiasts on Lake Travis will find good amounts of largemouth bass, Guadalupe bass, white bass, striped bass, catfish, and sunfish. Blue, channel, and flathead catfish can be found throughout Lake Travis. The winding lake provides prime spots for game fishing with its rocky banks, cliffs, steep drop-offs, points, and coves. When it comes to coverage, the upper end of the lake has plenty of flooded vegetation, while the lower end offers floating boat docks, marinas, ledges, and other structures. The water also becomes much clearer at the lower end, so sight fishing is possible. Bass fishing is prime in the springtime, when largemouth and white bass spawn. Largemouth bass hang out around drop-offs and points throughout the lake. White bass can be found in the major creek arms. Lake Travis is annually stocked with striped bass at the lower end of the lake. Striped bass can be fished year-round from the dam to the mouth of Sandy Creek. Find more information and tips on fishing on Lake Travis from the Texas Parks and Wildlife Department. 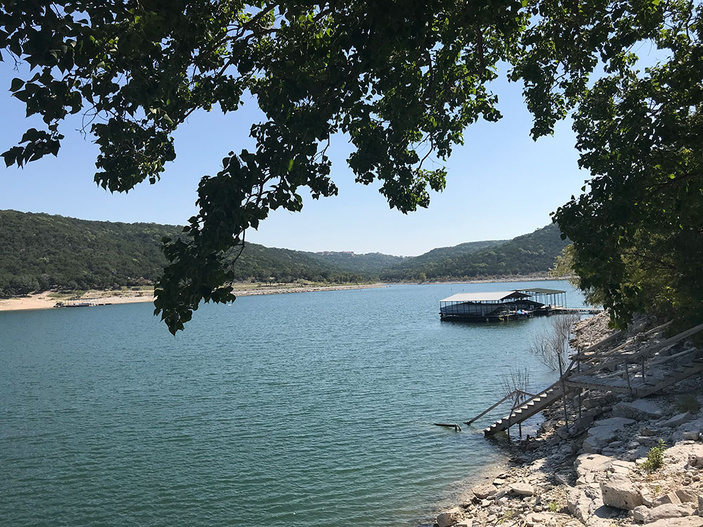 With 62 miles of lake from dam to dam, you can launch into the waters of Lake Travis at several public boat ramps operated by the Lower Colorado River Authority and Travis County. WORD OF CAUTION: Zebra mussels have infested Lake Travis. Clean, drain, and dry your boat, trailer, and other gear when leaving the lake to prevent the spread of the invasive Zebra mussels. Watch this video by TPWD to see how devastating they can be. These steps for prevention are required by law, and violators will be hit with a hefty fine of $500 for a first offense. For more information, visit texasinvasives.org. Bob Wentz Park at Windy Point, 7144 Comanche Trail in Austin — Ramp available for non-motorized watercraft only. Camp Creek Recreation Area, 1221 CR 343 in Marble Falls — Free ramp. Cypress Creek Park, 13601 Bullick Hollow Road in Austin — Two-lane concrete ramp. Launch fees. Gloster Bend Recreation Area, 3533 Hollingsworth Road in Marble Falls — Two-lane concrete lamp. Free. Jones Brothers Park, 10301 Lakeside Drive in Jonestown — Three public boat ramps, water level permitting. Launch fees. Mansfield Dam Park, 4370 Mansfield Dam Park Road in Austin — Four-lane ramp. Entrance fees. Muleshoe Bend Recreation Area, 2820 CR 414 in Spicewood — New ramp at Turner Farm. Entrance fees. Narrows Recreation Area, 2550 CR 411 in Spicewood — Free ramp. Pace Bend Park, 2011 Pace Bend Road North in Spicewood — Three boat ramps: Collier Cove, Tatum Cove, and Tournament point. Entrance fees. Sandy Creek Park, 9500 Lime Creek Road in Leander — Two-lane concrete ramp. Launch fee. Play along the scenic shores of Lake Travis at one of these parks below. Several local, county, and LCRA parks provide public access to the lake. Due to the length and magnitude of Lake Travis, we split the list into two groups: the upper and lower ends. The upper end runs from Marble Falls to the Burnet County side of Spicewood. The lower end runs from the Travis County side of Spicewood to Austin. The park sits on the upper end of Lake Travis and offers fishing or picnicking under shady pecan trees. Tent camping is allowed. The LCRA park doesn’t require a fee, and the facility even has a waterless toilet. The 508-acre, day-use LCRA park on the north shore of Lake Travis near Lago Vista is ideal for fishing and picnicking. Features over a mile of Shoreline and two secluded coves. Boat ramp, canoeing/kayaking, fishing, swimming. Restroom facilities. This LCRA park is an outdoor enthusiast’s mecca with a 6½-mile mountain-biking trail (some of it fairly challenging single-track), running trails, and horseback riding (you provide the equine). The park is located on the shores of Lake Travis, so it’s a great place to enjoy water activities. It becomes awash with wildflowers during the springtime. Entrance fees. Though small, this recreation area offers the only public boat ramp on Lake Travis’s upper south side. It also has a few picnic tables. The facility is closed at night except for the boat ramp. No entrance fees. The park is ideal for picnicking, sunbathing, hiking, fishing, camping, mountain biking, and horseback riding. There’s also primitive and improved campsites plus picnic tables, two boat ramps, and restrooms. Entrance fees. At 523 acres, this LCRA park has a lot to offer, including day hikes and lakeside camping. It has trails for biking, hiking, and horseback riding, while the shore offers fishing and swimming access. Entrance fees. This 400-acre LCRA park nestled along the Colorado River arm of Lake Travis is a great backdrop for fishing and camping. It doesn’t have a boat ramp, but you can launch canoes and kayaks from the park. The campsites are “unimproved,” but the lake views make up for it. Entrance fees. This day-use park is located in the basin area of Lake Travis. The shoreline is heavily used to recreation. Bob Wentz Park boasts a sand volleyball court, a shoreline walking path, picnic areas with barbecue grills, a pavilion available for rent, and a boat ramp. Entrance fees. This 15-acre, day-use park is a great spot for picnicking and fishing. Amenities include picnic tables, barbecue grills, and restrooms. A boat ramp provides a launch point onto the lake. Entrance fees. At 3.6 acres, Dink Pearson Park is undeveloped with a limestone shore and a nice, protected swimming area. Day-use only, no fees. This Travis County park lies in the basin area of Lake Travis. The park features a steep, rocky shoreline and provides some spectacular views of Lake Travis. Hippie Hollow is the only clothing-optional public park in Texas, and entry to the park is restricted to 18 years and older. This city park offers 64 acres of fun with 2 miles of trails, a butterfly garden, a dog park, playscapes, picnic areas, and more. There are basketball and volleyball courts as well as a baseball field. This Travis County day-use park is a primary access point for boaters with a four-lane boat ramp and parking for 112 trailer-towing vehicles. The park also offers hiking, picnicking, swimming, sunbathing, and even scuba diving. The park has a playground, concessions, chess tables, and a panoramic view of the Lake Travis basin. No entrance fee. Located in a quiet cove, this 92-acre Travis County park is a nice spot on Lake Travis. Swimming, nature walks, birding, camping, and fishing. Overnight camping is first come, first served. Boat ramp provides access to the lake. Entrance fees.